Question: How does someone become part of a fly-fishing company’s pro staff, and what does being part of a pro staff mean for the individual? 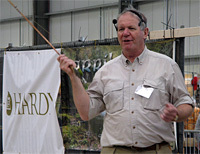 Jim Bartschi, president, Scott Fly Rod: “We have a professional guide program that offers discounts to verified licensed professional guides. Then we have the Scott Pro Staff. The Pro Staff differs in that they are not only professional guides or instructors, but also serve as Scott ambassadors to our dealers and customers. They help us staff shows, give presentations to both shop staff and the retailer’s customers, are active in media (both print and TV/film), and provide many of the images that end up in our catalogs, ads, and Web site. They are also very active in evaluating prototype designs and incubating new ideas. Potential Pros are recommended to us by our reps and dealers. We base our selections on a number of criteria. Foremost is their relationship with authorized Scott dealers and our territory rep, since most of their activities are regionally based. We also consider their fisheries, and look for unique waters, techniques, and species. This helps us develop rods that are less mainstream than the basic 9-foot 5-weight trout rod. Pro Staff: Industry professionals, key employees, guides, and media. Must be nominated by a sales representative and approved by us here in Dallas. Pro Staff members are not required to be TFO exclusive, and they receive product discounts for items used personally. Regional Advisory Staff: Members who have regional visibility and specializations within species or fisheries. Teaching is a major criteria. They are most often nominated by regional sales representatives, but Advisory Staff members contribute to both nomination and approval. They help identify regional trends and may become involved in rod design. They are also TFO exclusive and receive a mixture of free and discounted products. Advisory Staff: At-large members of the team who help with rod design, application, and general business trends. They have mastered most every aspect of the sport, they teach, and they are ambassadors for both fly fishing and TFO. Compensation varies from royalties to assistance in travel and appearance fees. Simon Gawesworth, Rio Products: “RIO has two different programs that might fit into the term ‘Pro staff.’ The first is for industry professionals, guides, outdoor writers, and shop staff. This program allows the individual to purchase a limited quantity of RIO or C&F product at a substantial discount. The validity of the person’s claim to being a ‘professional’ is authenticated through the regional sales rep. There are no expectations from RIO for the ‘pro,’ except that the products they purchase on this program must be used by the pro, and not sold or given to someone else. Tom Evenson, Western ELOG Director, Orvis: “We do have a ‘Pro-Program,’ which offers guides and outfitters a 40 percent discount on all our gear. However, they are not allowed to refer to themselves as ‘Orvis Pro Guides’ or any such thing. This is basically a courtesy discount for guides in the business.